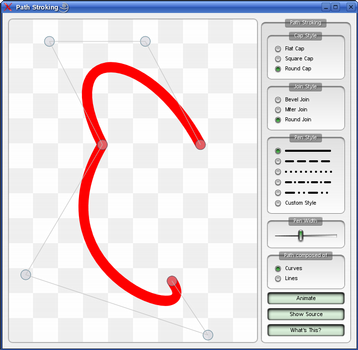 The QPen class defines how a QPainter should draw lines and outlines of shapes. A pen has a style(), width(), brush(), capStyle() and joinStyle(). The pen style defines the line type. The brush is used to fill strokes generated with the pen. Use the QBrush class to specify fill styles. The cap style determines the line end caps that can be drawn using QPainter, while the join style describes how joins between two lines are drawn. The pen width can be specified in both integer (width()) and floating point (widthF()) precision. A line width of zero indicates a cosmetic pen. This means that the pen width is always drawn one pixel wide, independent of the transformation set on the painter. The various settings can easily be modified using the corresponding setStyle(), setWidth(), setBrush(), setCapStyle() and setJoinStyle() functions (note that the painter's pen must be reset when altering the pen's properties). The default pen is a solid black brush with 0 width, square cap style (Qt::SquareCap), and bevel join style (Qt::BevelJoin). In addition QPen provides the color() and setColor() convenience functions to extract and set the color of the pen's brush, respectively. Pens may also be compared and streamed. Simply use the setStyle() function to convert the pen style to either of the built-in styles, except the Qt::CustomDashLine style which we will come back to shortly. Setting the style to Qt::NoPen tells the painter to not draw lines or outlines. The default pen style is Qt::SolidLine. Note that the dash pattern is specified in units of the pens width, e.g. a dash of length 5 in width 10 is 50 pixels long. The currently set dash pattern can be retrieved using the dashPattern() function. Use the isSolid() function to determine whether the pen has a solid fill, or not. The Qt::SquareCap style is a square line end that covers the end point and extends beyond it by half the line width. The Qt::FlatCap style is a square line end that does not cover the end point of the line. And the Qt::RoundCap style is a rounded line end covering the end point. Whether or not end points are drawn when the pen width is 0 or 1 depends on the cap style. Using Qt::SquareCap or Qt::RoundCap they are drawn, using Qt::FlatCap they are not drawn. The Qt::BevelJoin style fills the triangular notch between the two lines. The Qt::MiterJoin style extends the lines to meet at an angle. And the Qt::RoundJoin style fills a circular arc between the two lines. When the Qt::MiterJoin style is applied, it is possible to use the setMiterLimit() function to specify how far the miter join can extend from the join point. The miterLimit() is used to reduce artifacts between line joins where the lines are close to parallel. The miterLimit() must be specified in units of the pens width, e.g. a miter limit of 5 in width 10 is 50 pixels long. The default miter limit is 2, i.e. twice the pen width in pixels. The Path Stroking demo shows Qt's built-in dash patterns and shows how custom patterns can be used to extend the range of available patterns. See also QPainter, QBrush, Path Stroking Demo, and Scribble Example. Constructs a default black solid line pen with 0 width. Constructs a black pen with 0 width and the given style. Constructs a solid line pen with 0 width and the given color. See also setBrush() and setColor(). Constructs a pen with the specified brush, width, pen style, cap style and join style. See also setBrush(), setWidth(), setStyle(), setCapStyle(), and setJoinStyle(). Constructs a pen that is a copy of the given pen. Returns the brush used to fill strokes generated with this pen. Returns the pen's cap style. See also setCapStyle() and Cap Style. Returns the color of this pen's brush. See also brush() and setColor(). Returns the dash offset for the pen. Returns the dash pattern of this pen. See also setDashPattern(), style(), and isSolid(). Returns true if the pen is cosmetic; otherwise returns false. Cosmetic pens are used to draw strokes that have a constant width regardless of any transformations applied to the QPainter they are used with. Drawing a shape with a cosmetic pen ensures that its outline will have the same thickness at different scale factors. A zero width pen is cosmetic by default; pens with a non-zero width are non-cosmetic. See also setCosmetic() and widthF(). Returns true if the pen has a solid fill, otherwise false. See also style() and dashPattern(). Returns the pen's join style. See also setJoinStyle() and Join Style. Returns the miter limit of the pen. The miter limit is only relevant when the join style is set to Qt::MiterJoin. See also setMiterLimit() and Join Style. Sets the brush used to fill strokes generated with this pen to the given brush. Sets the pen's cap style to the given style. The default value is Qt::SquareCap. See also capStyle() and Cap Style. Sets the color of this pen's brush to the given color. See also setBrush() and color(). Sets this pen to cosmetic or non-cosmetic, depending on the value of cosmetic. Sets the dash offset (the starting point on the dash pattern) for this pen to the offset specified. The offset is measured in terms of the units used to specify the dash pattern. For example, a pattern where each stroke is four units long, followed by a gap of two units, will begin with the stroke when drawn as a line. However, if the dash offset is set to 4.0, any line drawn will begin with the gap. Values of the offset up to 4.0 will cause part of the stroke to be drawn first, and values of the offset between 4.0 and 6.0 will cause the line to begin with part of the gap. Note: This implicitly converts the style of the pen to Qt::CustomDashLine. Sets the dash pattern for this pen to the given pattern. This implicitly converts the style of the pen to Qt::CustomDashLine. The dash pattern is specified in units of the pens width; e.g. a dash of length 5 in width 10 is 50 pixels long. Note that a pen with zero width is equivalent to a cosmetic pen with a width of 1 pixel. Each dash is also subject to cap styles so a dash of 1 with square cap set will extend 0.5 pixels out in each direction resulting in a total width of 2. Note that the default cap style is Qt::SquareCap, meaning that a square line end covers the end point and extends beyond it by half the line width. See also setStyle(), dashPattern(), setCapStyle(), and setCosmetic(). Sets the pen's join style to the given style. The default value is Qt::BevelJoin. See also joinStyle() and Join Style. Sets the miter limit of this pen to the given limit. The miter limit describes how far a miter join can extend from the join point. This is used to reduce artifacts between line joins where the lines are close to parallel. This value does only have effect when the pen style is set to Qt::MiterJoin. The value is specified in units of the pen's width, e.g. a miter limit of 5 in width 10 is 50 pixels long. The default miter limit is 2, i.e. twice the pen width in pixels. See also miterLimit(), setJoinStyle(), and Join Style. Sets the pen style to the given style. See the Qt::PenStyle documentation for a list of the available styles. Since Qt 4.1 it is also possible to specify a custom dash pattern using the setDashPattern() function which implicitly converts the style of the pen to Qt::CustomDashLine. Note: This function resets the dash offset to zero. See also style() and Pen Style. Sets the pen width to the given width in pixels with integer precision. A line width of zero indicates a cosmetic pen. This means that the pen width is always drawn one pixel wide, independent of the transformation set on the painter. Setting a pen width with a negative value is not supported. See also setWidthF() and width(). 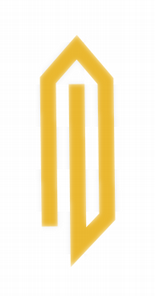 Sets the pen width to the given width in pixels with floating point precision. A line width of zero indicates a cosmetic pen. This means that the pen width is always drawn one pixel wide, independent of the transformation on the painter. See also setWidth() and widthF(). See also setStyle() and Pen Style. Returns the pen width with integer precision. Returns the pen width with floating point precision. Returns the pen as a QVariant. Returns true if the pen is different from the given pen; otherwise false. Two pens are different if they have different styles, widths or colors. Assigns the given pen to this pen and returns a reference to this pen. Returns true if the pen is equal to the given pen; otherwise false. Two pens are equal if they have equal styles, widths and colors. Writes the given pen to the given stream and returns a reference to the stream. Reads a pen from the given stream into the given pen and returns a reference to the stream.